Travel-Tot: Destination: Pioneer Valley, MA! "Arrive curious. Leave inspired!" It's more than just four words that pique the curiosity of the listener; it's the catchphrase for Pioneer Valley, MA! Located in western Massachusetts, Pioneer Valley is comprised of a group of closely knit towns, including: Springfield, Northampton, and Amherst (among others!). The area is rich not only in beautiful scenery (particularly in the fall! ), but also in great family-friendly museums and attractions! Below are some of our favorites! Featuring a variety of exotic animals, this zoo appeals to visitors of every age! The Zoo in Forest Park hosts a variety of different events almost every weekend, allowing guests to explore all aspects of science, while having a good time! Few people realize that a young Theodor Seuss Geisel regularly called the zoo his playground and that his father was actually a parks commissioner in charge of the Forest Park Zoo in the early 1900's! Hours of operation are seasonal, so be sure to consult their website before planning a visit! Celebrate nature's diversity, check out the Zoo at Forest Park! One of a collection of five of Springfield's world-class museums, the Springfield Science Museum is a wonderland for toddlers and young children - particularly those with an interest in dinosaurs or space! With giant replicas of dinosaur skeletons, touchable fossils, and a cast of a sauropod footprint that children are welcome to climb into, Dinosaur Hall is a crowd pleaser! The Seymour Planetarium offers breathtaking shows about the wonders of the night skies! Events and exhibits are subject to seasonal availability - so be sure to check their website for information before planning a visit! 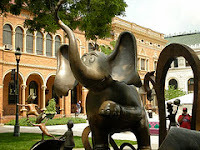 Located in the quadrangle between the Springfield Science Museum and the other Springfield museums, is a tribute to one of America's most beloved storytellers, Theodor Seuss Geisel, better known to most of us as Dr. Seuss. A Springfield native, Dr. Seuss has been immortalized in bronze along with many of his most well-known and loved characters! Sculpted by Lark Grey Dimond-Cates (Geisel's step-daughter), these towering tributes are as inspiring to parents as they are to children! The sculpture garden is open daily 9am-5pm. Founded in part by Eric Carle, the renowned author and illustrator of more than 70 books, including the 1969 classic The Very Hungry Caterpillar, The Eric Carle Museum of Picture Book Art is the first full-scale museum in this country devoted to national and international picture book art, conceived and built with the aim of celebrating the art that we are first exposed to as children. The Museum houses three galleries dedicated to rotating exhibitions of picture book art, a hands-on Art Studio, a Reading Library, an Auditorium, a popular Cafe, and a Museum Shop (check out the great virtual tour!). Hours of operation vary by day, so be sure to consult their website before planning a visit! With everything from fantastic kid-friendly attractions to fascinating arts and culture - Greater Springfield, Northampton, Amherst and the Pioneer Valley is filled with family fun! Happy Travels!